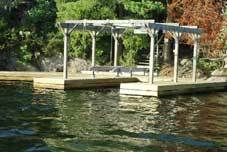 We specialize in shorelines, from docks, decks and boathouses to landscaping, barging, and dredging. If you can imagine it, we can take care of the rest. Contact us for a free consultation. the workmanship was excellent and it was a pleasure dealing with the Taylor Team!" Do you have product questions? Would you like to book a free site visit or ask for a quote? Please let us know, we’d be happy to help you out! Canada’s diverse landscapes and shorelines make it impossible for there to be a standard type of dock for a waterfront. 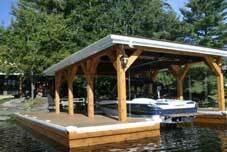 Taylor Docks can design a dock system to suit your needs. Our experienced crew can help you to make your imagination a reality. 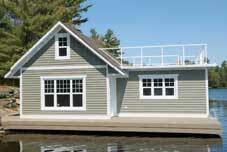 We meet with clients to discuss what they would like from a boathouse or boatport and come up with a plan. Dry boat weights are often understated by manufactureres and do not account for gear & fuel. We recommend dry boat weight + 20% for fully loaded weight (does not include water ballast.